Supports Print Screen key, Zoombox for easy capture, Automatic saving to files, JPEG, BMP and GIF, Clipboard, System tray, Easy hotkey setup. It has no expiration date and free distribution. 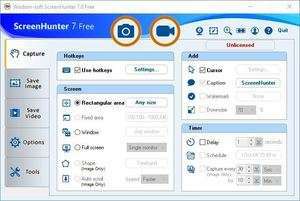 For security reasons, you should also check out the ScreenHunter Free download at LO4D.com which includes virus and malware tests. Additional screenshots of this application download may be available, too. ScreenHunter Free has a presence on social networks.